It’s like a fairy from a science-fiction movie, and that makes it a brilliant idea for pretty and easy Halloween makeup looks. That pink and goldy-yellow glow is easy to recreate with the right shades of makeup and some clever blending, and we especially love those long and dramatic lashes. 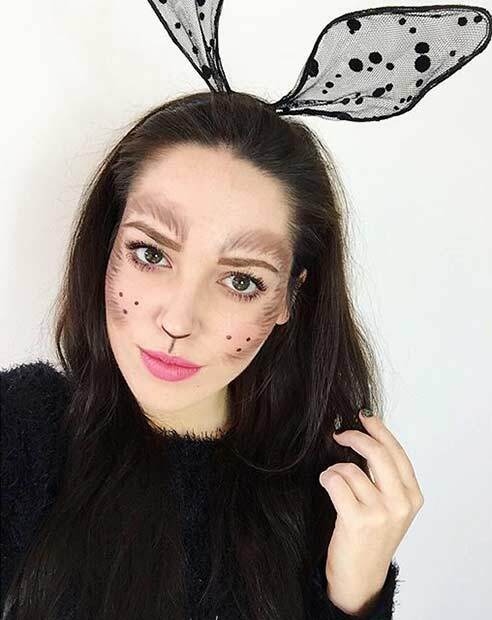 Halloween is the perfect time to play around with looks you’d never be bold or brave enough to try, and we reckon this is the cutest and prettiest one to start with. Black cats aren’t always seen as bad luck though – in some places, black cats were considered to be good luck. Japan, for example, believe that black cats are the bringer of good luck, and in Britain they’re believe to bring affluence. Plus we all know about the Ancient Egyptians – they loved their feline friends. 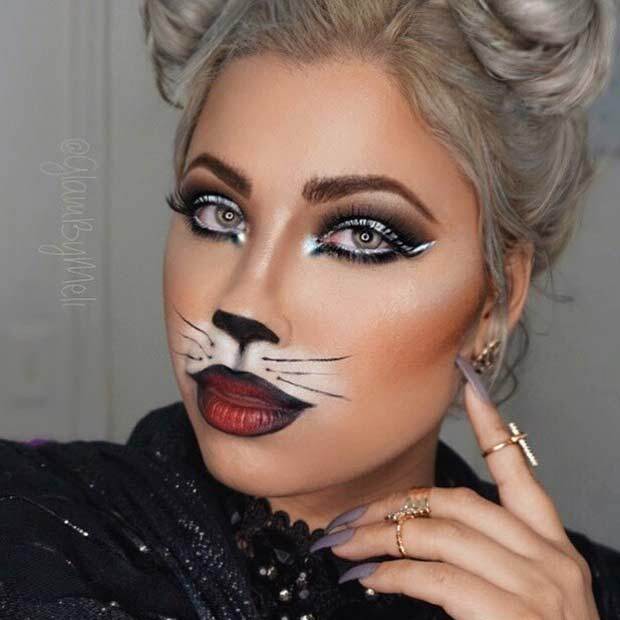 We love this feline-themed makeup, a brilliant idea when you’re on the hunt for pretty and easy Halloween makeup looks. 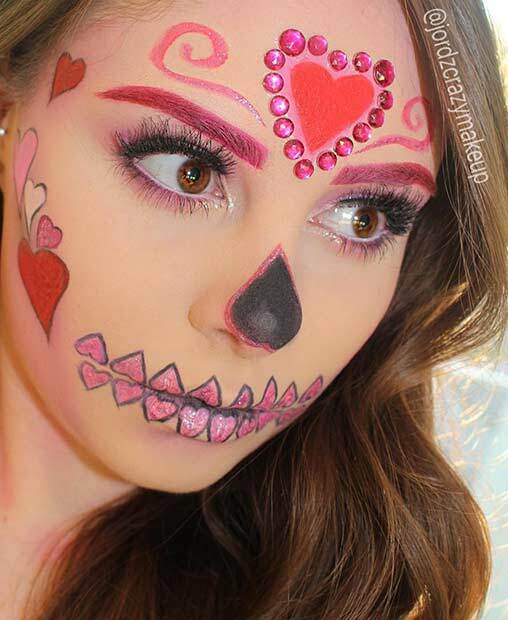 The sugar skull / Day of the Dead look has become popular over recent years, and this one is an adorable look – pretty in pink and embellished with all things pink, shiny and wonderful. It’s scary and cute all at the same time. 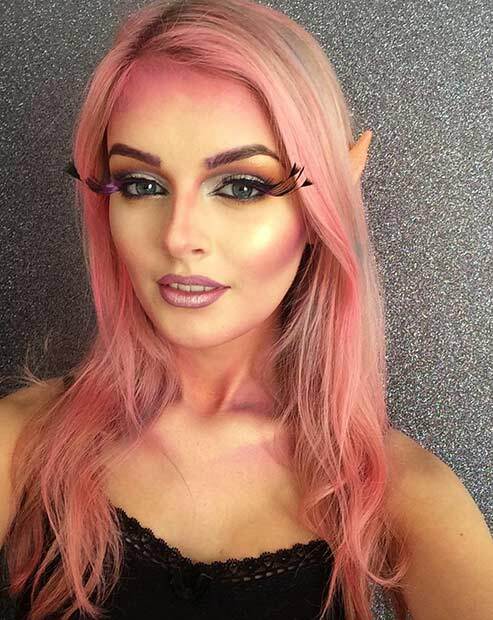 With the help of pink eyeliner, it’s simple a case of adding hearts to the face, surrounding those with gems, and making your eyebrows match the rest of the look, in this case, a beautiful pink shade. You could even switch this up to different pastel shades to match your outfit too – greens, blues, lilacs, etc. We are loving the lips on this look – it’s a little kitty-like but at the same time, a little comic book-like too. In fact, we think it might just be the perfect combination for pretty and easy Halloween makeup looks. Those lips are easier to recreate than you first may have thought. Once you have that pinky-blush base, you add a black lip or eye liner pencil to the surrounding, giving it that comic-book outline. A white eyeshadow can be dabbed carefully in place for that glossy shine on the bottom lip, or you could use a white liquid eyeliner too. We’ve had great success with the latter. 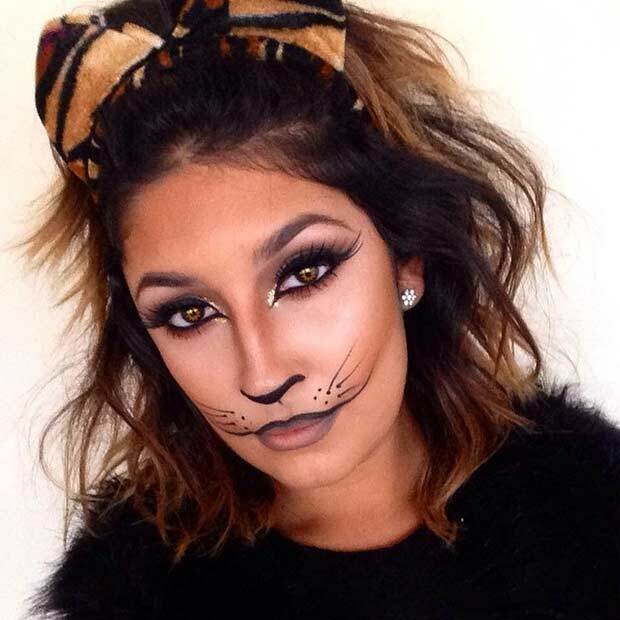 Black eyeliner can be used for those whiskers, the faux-eyelashes, and the nose too. You know all those darker shades in your contour palette that you never get the chance to use because they’re too dark for your skin? 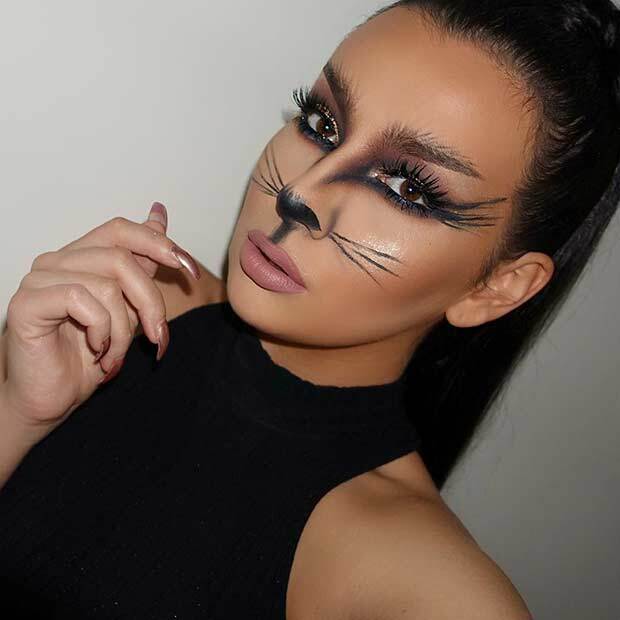 Well, now you have the perfect opportunity to use them – in this glorious feline look. 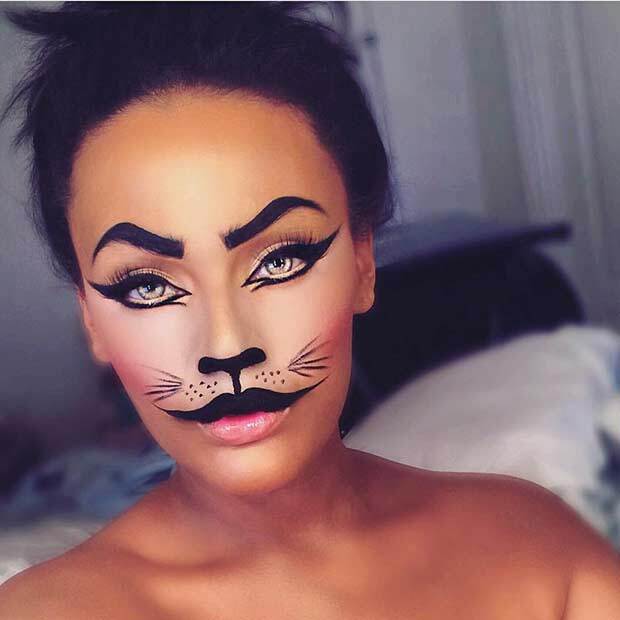 The cat wins hands-down when you’re looking for pretty and easy Halloween makeup looks, and it’s not hard to see why. 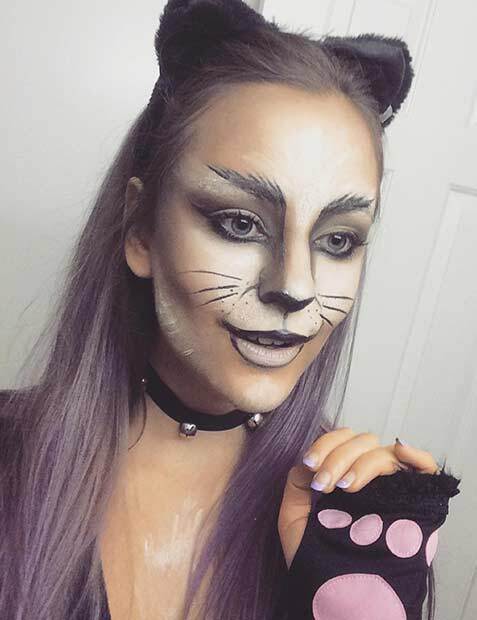 Everything is super simple as long as you have a steady hand, and it’s just a case of adding a black top lip, a black nose-tip, and kitty-shaped black eyes before applying those finishing touches – the whiskers. We’ve had the white bunny, and now it’s time for the black bunny. Because they’re super cute too … right? 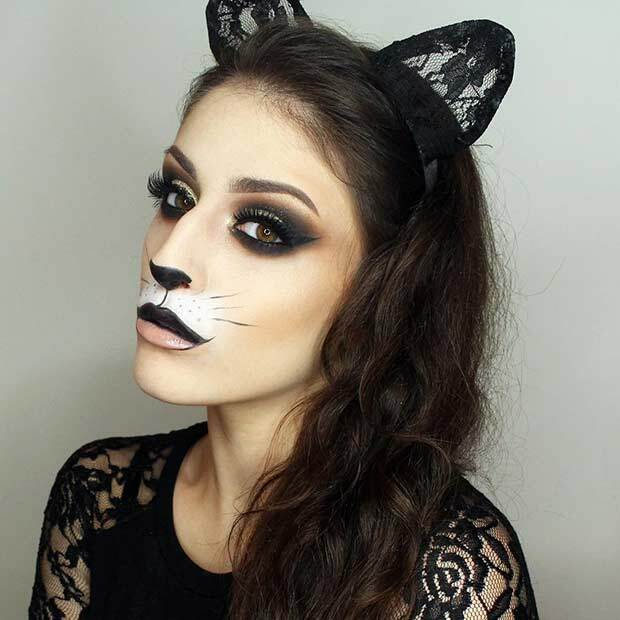 This look is super simple, great for those who don’t want to wear mounds of makeup on Halloween. We all know how hard it is to keep layers upon layers of makeup in check when you’re hot, dancing, and enjoying a few glasses of fizzy pop. A lighter shade foundation is needed for the base, and you’ll need a pretty pastel pink for the lips. If you don’t have the right shade of lip product to hand, you can use one of those pastel pink eye shadows you never use in the palette. Dab some on the lips and you’ll recreate that beautiful shade. 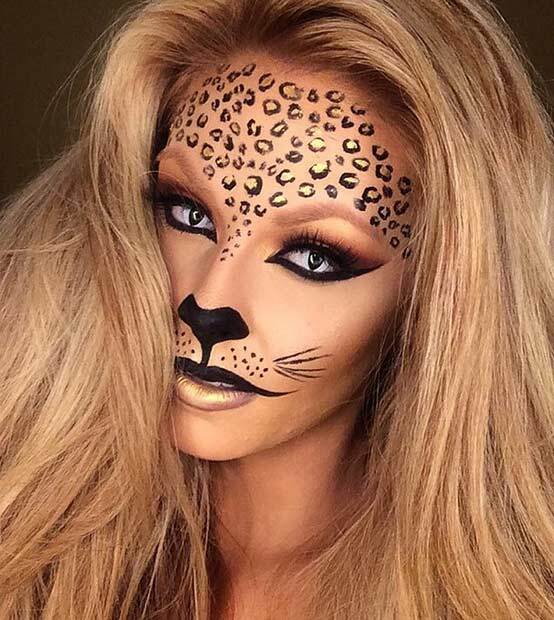 Once you’re done with that, brown streaks and smudges will recreate the fur around the edges of the face, and a black eyeliner can add the nose, and those dots on the cheeks. Cute, right? Before you apply any color or shadow to your eyelids, cover the entire lids with a white eyeliner pencil first. The white base will make any color applied over the top really shine brightly. Think of it as adding the shadow to a completely blank white canvas. When trying to achieve the perfect cat-eye with your black eyeliner, there’s a great trick you can use. We’re full of great tricks today! Paint the outside of the kitten-flick first, and then fill it in. That’s as easy as it gets. First apply the flicks from the outer corner of your eye in the direction of the edge of your eyebrow, and then paint the liner on the lid itself after. Once you’ve got that basic shape, the rest will come much easier. 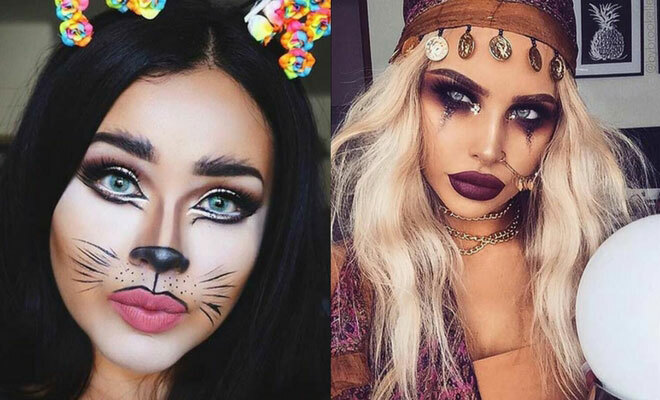 And while we’re on the subject of perfect kitten-flicks which, let’s face it, is super important when looking at pretty and easy Halloween makeup looks because there’s a lot of cat-eyes, a spoon might just be your greatest ally. Getting eyeliner right is hard. Getting eyeliner to match on both eyes is equally hard. A tool to even things out is necessary – a teaspoon is just the right tool. You can use the handle of the spoon as your straight line to get those kitten flicks just right, and the curved edge of the spoon is just right for helping you to get the rest the right shape. Plus, holding the spoon underneath your bottom lashes will prevent you from getting mascara everywhere. Who knew you just needed a spoon? 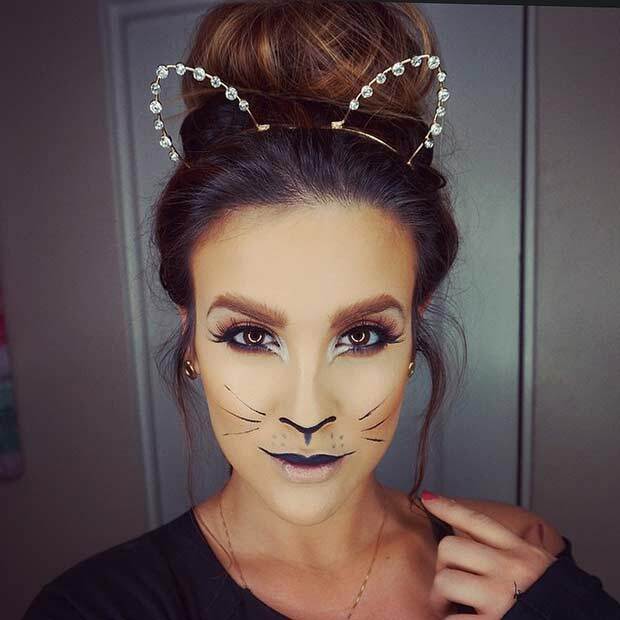 Accessories are important for getting your pretty and easy Halloween makeup looks spot on, just like these kitty-ears. We think they’re perfect, and pretty adorable too. What do you think? Even if you only have minimal time to get your makeup look right, the ears will instantly help to stop people saying things like, “Oh, so what are you meant to be tonight?” Plus … any excuse to buy more accessories. And we really need these ears. And now for the most intricate kitty of them all – black and white kitty. A little bit spooky, a little bit cute, a lot awesome. For this one, you’ll need to think a little outside the box. Forget everything you’ve learned about how you *should* do your eyebrows, and do them a little differently instead. The aim of the game is to make your makeup as big and as bold as you can – it’s Halloween after all. Cheetah (or leopard) print is actually a lot easier to recreate than you first may have thought, and once you’ve mastered the basics, there’s nothing you won’t be able to leopard-print-up. Imagine having beautiful leopard nails to match your stunning leopard makeup. All you need to do is place a blob of that darker brown / bronze shade on your face and then grab yourself a black / dark brown eyeliner. You simply brush the liner around the edge of the darker blob of eyeshadow, or whatever you’ve used in that original darker shade, and you have something that looks a little like this. It’s so much easier than you thought, right? What about glam kitty though? It’s a stunning look, right? 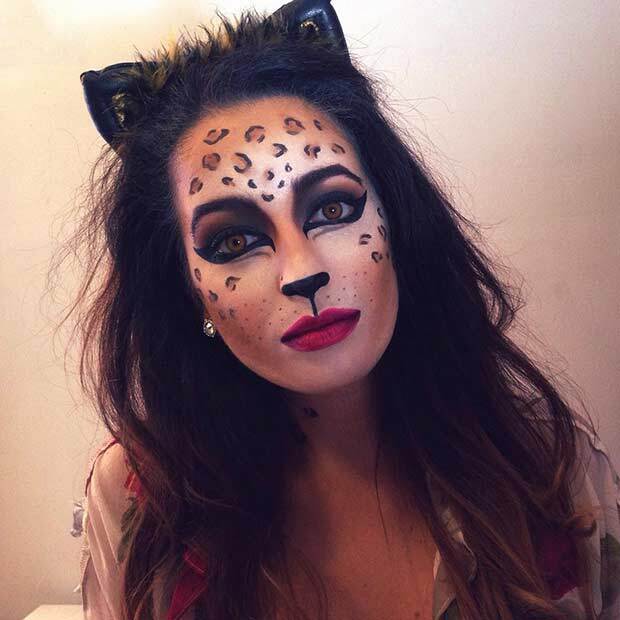 And the even greater news is that pretty and easy Halloween makeup looks take just a few minutes. 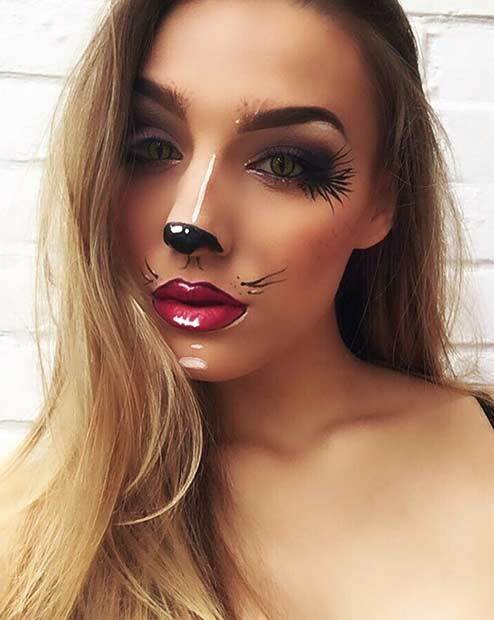 Everything about these pretty and easy Halloween makeup looks is super awesome, and a lot of them can be created with tools you’ll already have in your makeup bag. Perhaps it’s about time you sat down and got practicing with your cute kitty? As we’ve said before, black cats and Halloween go hand in hand!